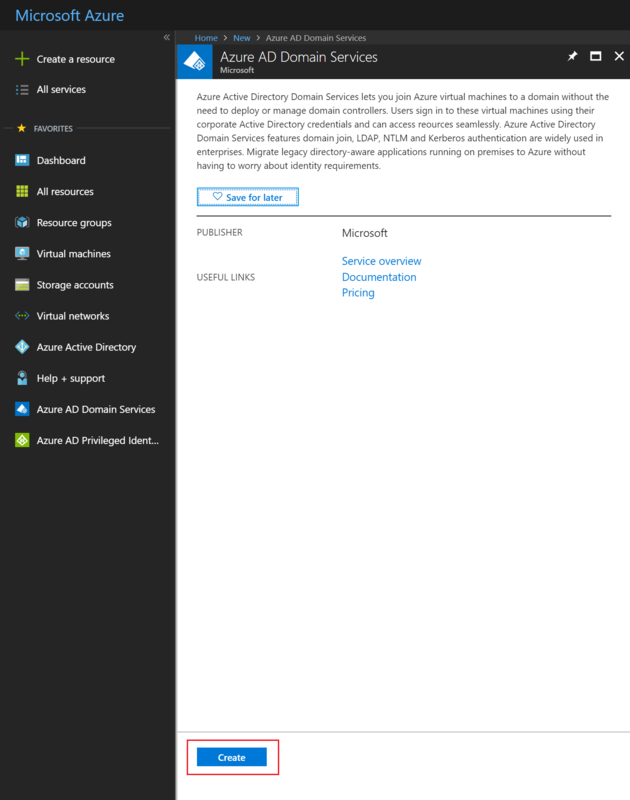 This article shows how to enable Azure Active Directory Domain Services (Azure AD DS) using the Azure portal. In the left pane, click Create a resource. In the New page, type Domain Services into the search bar. Click to select Azure AD Domain Services from the list of search suggestions. 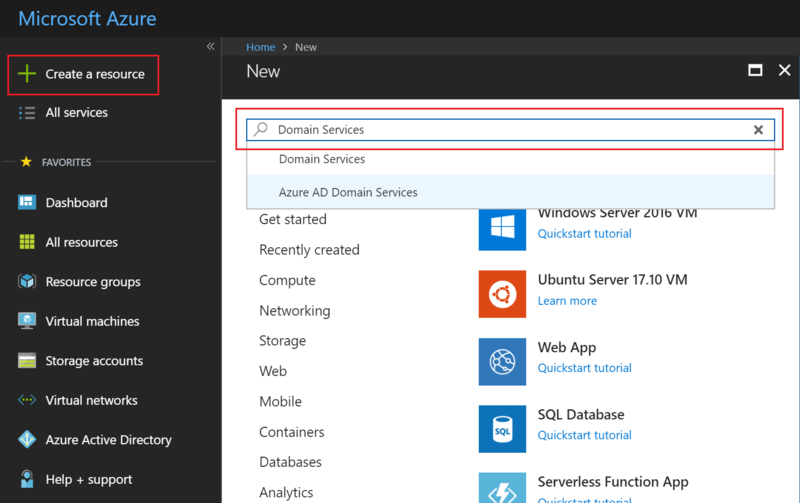 On the Azure AD Domain Services page, click the Create button. The Enable Azure AD Domain Services wizard is launched. In the Basics page of the wizard, specify the DNS domain name for the managed domain. You can also choose the resource group and Azure location to which the managed domain should be deployed. Choose the DNS domain name for your managed domain. Built-in domain name: By default, the wizard specifies the default/built-in domain name of the directory (with a .onmicrosoft.com suffix) for you. If you choose to enable secure LDAP access to the managed domain over the internet, expect issues creating a public DNS record or obtaining a secure LDAP certificate from a public CA for this domain name. Microsoft owns the .onmicrosoft.com domain and CAs will not issue certificates vouching for this domain. Custom domain names: You can also type in a custom domain name. In this example, the custom domain name is contoso100.com. Non-routable domain suffixes: We generally recommend avoiding a non-routable domain name suffix. For instance, it is better to avoid creating a domain with the DNS domain name 'contoso.local'. The '.local' DNS suffix is not routable and can cause issues with DNS resolution. Domain prefix restrictions: The prefix of your specified domain name (for example, contoso100 in the contoso100.com domain name) must contain 15 or fewer characters. You cannot create a managed domain with a prefix longer than 15 characters. You already have an Active Directory domain with the same DNS domain name on the virtual network. The virtual network where you plan to enable the managed domain has a VPN connection with your on-premises network. In this scenario, ensure you don't have a domain with the same DNS domain name on your on-premises network. You have an existing cloud service with that name on the virtual network. 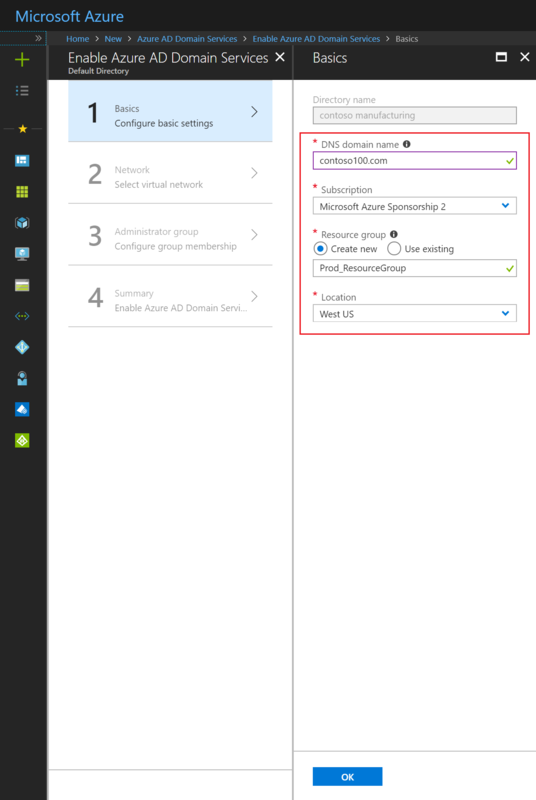 Select the Azure Subscription in which you would like to create the managed domain. Select the Resource group to which the managed domain should belong. Choose either the Create new or Use existing options to select the resource group. Choose the Azure Location in which the managed domain should be created. On the Network page of the wizard, you see only virtual networks that belong to the location you have selected. Click OK to move on to the Network page of the wizard.